luxury rice barge journey into Thai culture and the Thai heart. 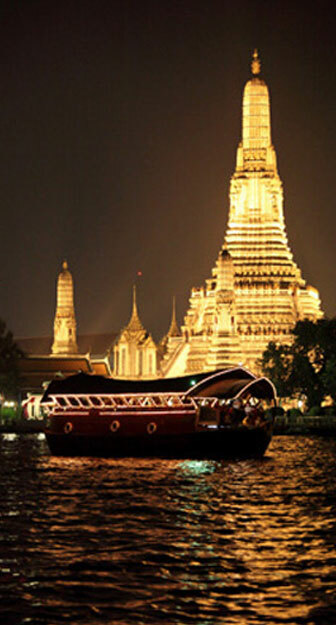 Five star dining, traditional culture and touring, on the only original antique teakwood rice barge on the river in Bangkok. Experience first-class Thai hospitality and delicious food from around Thailand in the comfort and tranquility of this luxury, open-air cruise. Guests are welcomed aboard the Tahsaneeya Nava by one of our traditionally attired hostesses with a rose-water sprinkling ceremony and jasmine garland presentation. Scented cool towels are offered to our guests to refresh themselves. During our candle-lit romantic and sedate cruise along the Chao Phraya River, traditional kim music (Thai xylophone) is played gently in the background. Several non-intrusive short sets of Thai classical dancing are interspersed through the meal. Our boat is noted for its floral appearance, featuring fresh and cut flowers from all over Thailand. Safety on board is of major importance. Our safety equipment is inspected and maintained regularly, and a life jacket is provided under every seat. We have an unblemished thirtyfive-year safety record. Every guest receives an illustrated map “&” history booklet of the river. Enjoy the subtle spices of our superlative range of traditional Thai dishes, using only the freshest top-quality products, on any of our 6-course Thai Traditional, Thai Seafood or Thai Vegetarian set menus. Each menu is carefully designed to satisfy all palates, drawing upon dishes from each of Thailand’s distinct gastronomic regions – the North, the Northeast (Isaan), the South and the Central Plains. Guests are provided with a description of the dishes and the regions from which they originate.The evening commences with a delicious assortment of hot and cold canapés, which can be savored with one of our appetite-whetting aperitifs or cocktails. A select range of red, white and rosé wines is available from our barlist to accompany your main meal, as well as our judiciously chosen house wine (which may be purchased by the glass or carafe). A delightful platter of traditional Thai desserts and fresh fruit round off your meal, followed by coffee or tea. A digestif may be purchased from our after-dinner drinks trolley to complete this unforgettable Thai dining experience. Contact us to make a reservation. Price is net per person incl. Pick Up & Drop Off Service For prick up from hotel, Driver will wait you at hotel’s lobby. In case of miss transfer, please contact +6681-9393008 (Mr.Nat) for assistant.